Cancun is the ideal place for all types of tourists: couples, groups of friends and families. Here you will find 4 perfect activities for having fun with your relatives, although they can work for friends and partners too. You can’t miss any of them! Since Xcaret’s opening in December 1990, this ecologic park combines the most amazing wonders in the Mayan Riviera: sacred cenotes, underground rivers and unique flora and fauna. This is the ideal place to fulfill the family’s adventurous desires. Discover the price of this all-inclusive package to Xcaret, the activities you can do there and more details here. If you want your kids to be entertained and learn something new, this is the best place, because they will be able to see, touch and even swim with dolphins, if they want to. This unique aquarium is home to more than 1,195 marine species and has dedicated areas for touching and learning about marine mammals. It’s located in the shopping center La Isla, so other members of the family can shop around while the kids are having fun. With the apps available in the iPad Zone, the kids will learn more about the environment and preservation of marine life. Discover more about Interactive Aquarium Cancun! 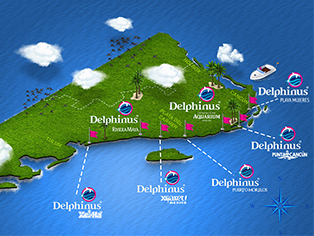 After learning about marine fauna, what could be better than living the unique experience of swimming with dolphins? If your children are older than 8, they can do it alone; if not, you can go with them and be part of an unforgettable moment! The best part is that there are several types of swims with dolphins, perfect for the whole family in different places: Xcaret, Mayan Riviera, Xel-há and more. Find all the possibilities here! Just like Xcaret, Xel-há is another excellent aquatic park in the area. This park promotes sustainable tourism with attractions for all the family, ideal for when you are on vacations. Here, you can snorkel, explore the Mayan Cave, jump from the Piedra de Valor that is 5 meters high, go through the park along a zip line, enjoy the Bahía de los Caprichos and let the kids enjoy the Kids World. Go to this amazing park with an all-inclusive package. Discover what it includes here. You just need to schedule your plans for your next vacation and enjoy the Mexican Caribbean with all your family! 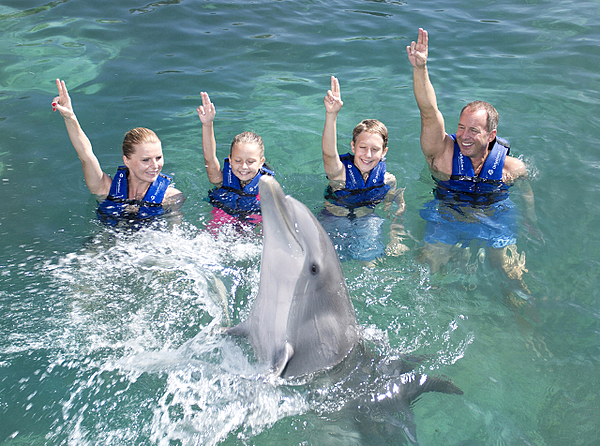 Swim with dolphins in Xcaret and inspire your family to discover new opportunities!